Select 1st Sgt. Bishop Brig. Gen. Brother Capt. Chaplain Chief Cmdr. Coach Col. Cpl. Deacon Dr. Drs. Elder Evangelist Father Gen. Judge Lady Lt. Lt. Cmdr. Lt. Col. Lt. Gen LTC Maj. Gen. Major Miss Mr. Mrs. Ms. Mst. Sgt. Padre Pastor Pres. Prof. Pvt. Rabbi Rev. Revs. Senator Sfc Sgt. Sgt. Maj. Sir Sister Sr. Srta. Staff Sgt. Tech Sgt. Your Prayers Will Move Mountains! What mountains do you face in your life today? Maybe you’re standing at the foot of a financial struggle, health problems, or damaged relationship. Perhaps you’re so overwhelmed you can’t see the peak ... or imagine being able to reach the summit at all. There is good news: You don’t have to — because God is doing the moving! Your faith — even just a little — is enough. God will use it to move the tallest mountains in your life and the lives of those around you. To remind you daily of how powerful your prayers are, please let us send our brand-new Hour of Power Prayer Pillow as our thanks for your generous gift of support. Perfect to place on your couch or bed — or to share with a loved one who may be facing a new season or scaling some mountains in life — the Prayer Pillow will be an encouragement to never give up hope. God hears you, loves you, and will move your mountains! 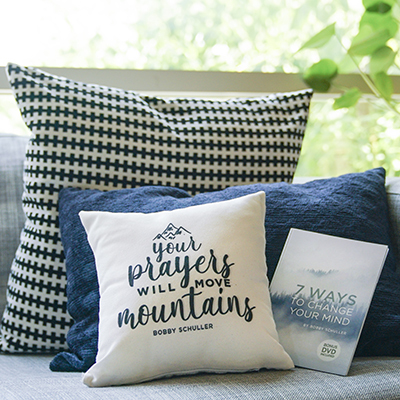 For your generous gift of $50 or more, let us thank you by sending the Prayer Pillow AND Pastor Bobby’s encouraging and uplifting book 7 Ways to Change Your Mind. Especially in times of transition and challenge, choosing to think positively makes a huge difference — increasing our faith in God and preventing sin and shame from clouding our minds. And this resource will help you do just that, whatever season you’re in. 7 Ways to Change Your Mind also includes a DVD of Bobby’s message “As a Man Thinketh” — one that will further your study and help you or a loved one think about good, Godly things. We love you and are here for you! Please let us know how we can be praying for you or praising God with you. PLEASE NOTE: On behalf of our entire Hour of Power team, thank you for your generosity and support. Due to a delay in production, your prayer pillow will be on its way to you at the end of October. We apologize for any inconvenience and are grateful for your patience and understanding.